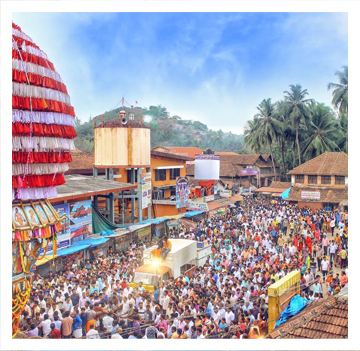 Shree Rajarajeshwari temple is located at Polali in Kariyangala Village of Bantwal Taluk in Dakshina Kannada District of Karnataka State. Shree Kshetra Polali is in the heart of this village surrounded by high hillocks and wide paddy fields. River Phalguni flows from east on the northern side a furlong way from the temple. It turns left towards south at the back of the temple in the Western side. This place was being called as Pural and the deity in the temple was known as Porala Devi in several old records and ancient epigraphs available. When evil forces gained strength and got the upper hand and embodied themselves as demons and began to destroy the Dharma Setu (Bridge of Dharma). Rajas and Tamas were the most predominant evil qualities in them. They tortured the people in innumerable ways. In such a situation Shree Bhuvaneshwari, Divine Mother assumed divine forms with the names Kumari, Tripura, Kali and Durga and established the age old Dharma by destroying the wicked and protecting the good. Later, after many years with the advice of Divine sage Narada the destitute Gods engaged themselves in meditation, worship and penance to make the Divine Mother manifest before them. They even got ready to Sacrifice their bodies in the blazing fire of Yajna. Shree Bhuvaneshwari in Manidweepa (Island of gems) saw the sufferings and penance of Gods and appearedbefore them in the bright form of Lalitha Devi, which is the full incarnation of Shree Bhuvaneshwari. Gods of heaven and Thrimurthis built a mahamantapa and a chariot for Shree Bhuvaneshwari with the help of Vishwakarma. Brahma and other Gods assembled in the Mahamantapa and with just a look at Goddess Shree Mahadevi the things they desired was fulfilled. Goddess boarded her Shree Chakra ornamented with navaparvas. Shree Devi with her large army and assistants advanced in no time and arrived at Shonithapura of Bhandasura and encamped there. The battle raged. Within four days Bhandasura's brothers, nephews, relatives and ministers, army chief and large army died fighting against the army of Shree Mahadevi. On fifth day Bandasura himself came and fought against Shree Mahadevi and died. All the three worlds again returned to peace and happiness. Shortly afterwards Hari, Hara and Brahma engaged the services of the sculptors Vishwakarma and Maya and got sixteen cities built in the Himalayan region and in other places for the stay of the Divine Mother. All these towns were called Shreenagar and Shree Bhuvaneshwari still lives in these sixteen cities and protects all the worlds from the evil forces. The pious soul who installed and worshipped the clay image of Shree Rajarajeshwari with subordinate deities in the ancient days deserves our greatest gratitude. It is well known that King Suratha installed and worshiped Shree Rajarajeshwari. Starting from Swayambhuva there are fourteen Manus. In the early years, Swarochisha, the second Manu begot a son by name Chaitra. King Suratha was born in his line after many years. His vast kingdom spread all over the world. Unfortunately by force of circumstances he had to fight with a band of hunters by name 'Kolavidhwamsi'. Even though they were less powerful, King Suratha suffered defeat at their hands. Therefore the King totally withdrew from the areas overrun by his enemies and returned to his capital city. It is not easy to clarify the antiquity and importance of Polali Shree Rajarajeshwari Temple with historical evidences. It is said there were many inscriptions here and there around the temple. But, in the past these inscriptions might have been destroyed or taken away due to the indifferent attitude of the persons responsible for their upkeep.